Given the wild growth we're seeing in the craft beer industry, it's rather embarrassing in my mind that there is no industry standard with regard to product freshness. A lot of breweries simply toss their beer out into the market without any indication of when it was packaged or how long it ought to be good. Andy Crouch's recent column in BeerAdvocate reminded me of this stupefying fact. The main issue Crouch addresses in his column is the relative worthlessness of best-by dates on packaged beer. Such dates are less than useful because there is no industry standard for what they mean. Some breweries say their beer is good for six months or a year. Seriously? Look, we all know all beer doesn't have a "fresh requirement." Some beers, particularly darker, heavier styles, can improve with a bit (or a lot) of cellaring. But lighter beers and hoppier beers are virtually always better when you drink them fresh. These beers detest light and travel, and they do not age well in any scenario. The best way to know you're getting freshness in a packaged beer is to see the bottling (or canning) date on the label or container. Armed with that information you, the consumer, can make an informed decision on whether you wish to purchase the product. An IPA or pale bottled six or eight months ago ought to send your hand reaching for something else...something packaged more recently. Looking around the Oregon landscape, I'm amazed at how few breweries put "bottled-on" dating on their beer. I surveyed the shelves at my neighborhood Freddy's and found many cases where there is nothing at all on bottles (or cans) to help consumers...or breweries use the less meaningful "best-by" dating. One brewery that does use "bottled-on" dating is Laurelwood. Beer brewed at the Sandy Blvd. 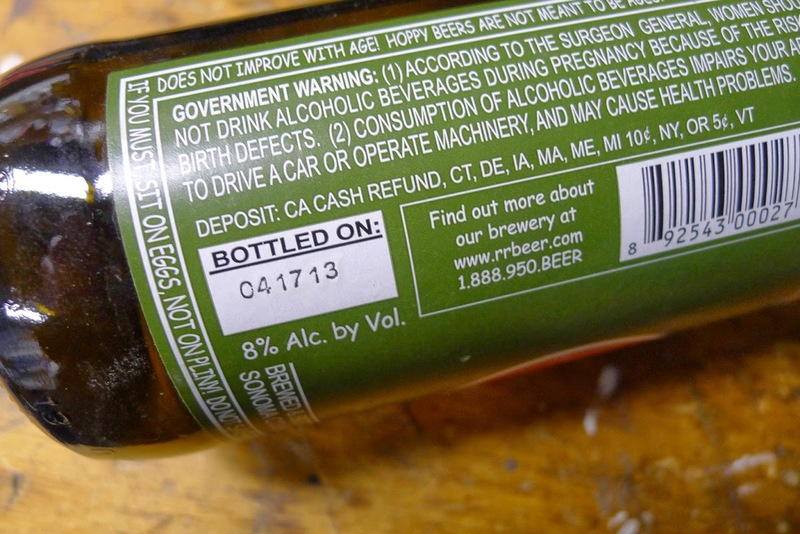 location and packaged by Green Bottling has dates screened onto bottles. Workhorse and Free Range Red brewed and bottled by the Craft Brew Alliance in Woodinville, Wash gets standard CBA dating on all bottles. 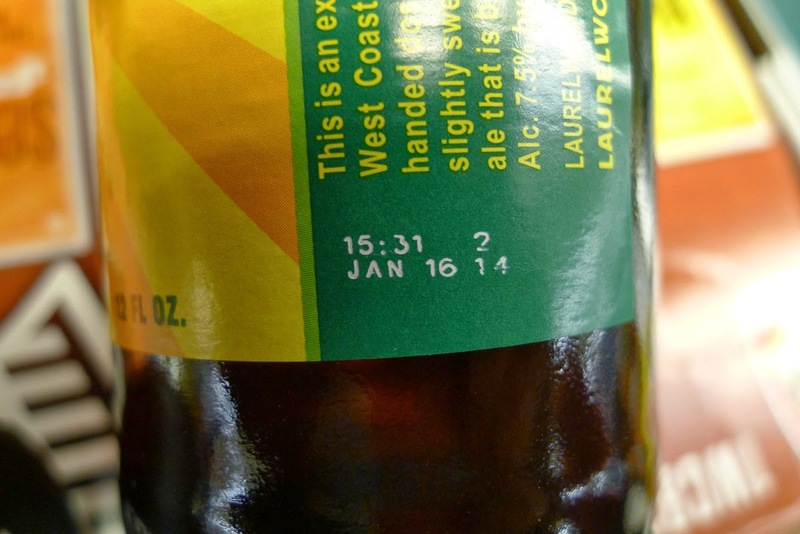 "We want 'bottled-on" dates on our bottles," Laurelwood owner Mike DeKalb told me. "We''re committed to ensuring that our customers get our beer at its best. We ask retailers and distributors to maintain appropriate rotation and we have a buy back (or dump) program with most of our distributors." There's some additional expense involved in putting dates on bottles, but it's minimal. Laurelwood pays an additional $75 when Green Bottling puts dates on bottles during a run, typically several pallets of beer. So the cost per bottle is low. Everyone ought to be doing this. The best labeling example I came across was on a bottle of Sticky Hands from Block 15 in Corvallis. 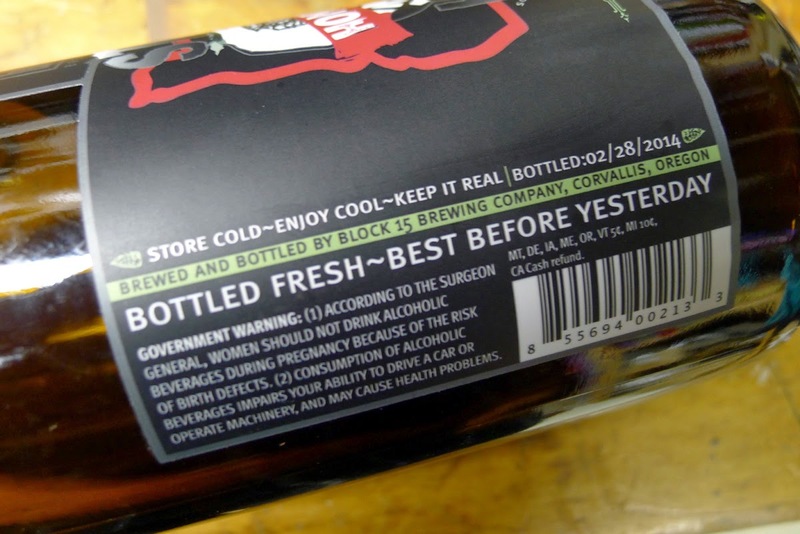 Underneath a very clear "bottled-on" date, Block 15 advises the consumer that the beer is "Bottled Fresh~Best by Yesterday." A little humor is always good. I bought this bottle only a couple of days after it was bottled and drank it a day later with excellent results. Honestly, I'm mystified that Oregon's craft brewers (indeed, craft brewers everywhere) haven't gotten together and established a standard for freshness. And let's not stop there. Let's put dating in a standard place so consumers don't have to search to it. Doing this will have virtually no impact on profit and it's a huge plus for consumers. Can someone please tell me why this can't or shouldn't happen? The industry is mature enough and flush enough to get moving on this. It's time to end the guesswork on fresh beer.